Our first content upgrade/click popup combo went up on August 31st, 2015. Our last went up yesterday. In four and a half months and on 22 articles, they've generated 832 blog subscribers. 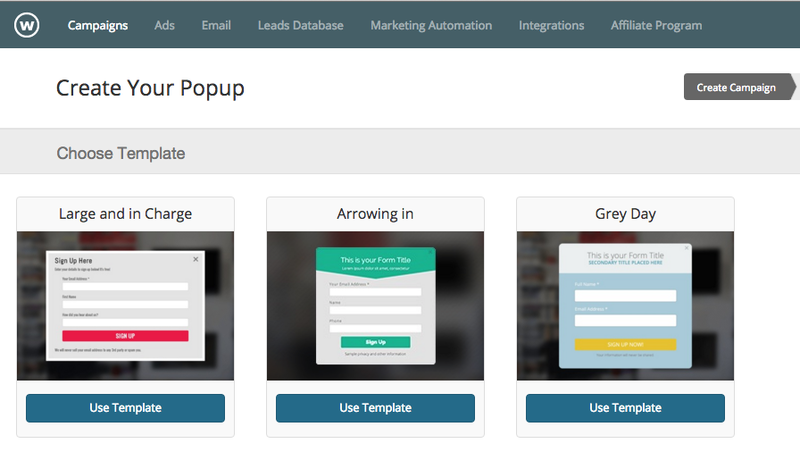 This article will break down the mechanics behind using click popups for lead generation, give you a step-by-step guide to adding them to your own site and give you 5 use cases (which aren't content upgrades). Without further ado, let's get rolling. Anything can be a click popup trigger (for instance, this word triggers a click popup). The average conversion rate on a content upgrade click popup is 54.84%, while ebook landing pages convert at 27.47%. That's a 99.64% increase - close enough to double as makes no difference. Click popups can be converted on without opening a new tab or window, and you might be surprised how much friction that waiting around causes your prospective leads. Of course, an exit, entry, scroll and timed popup can also be converted on without opening a new tab. But all of these types are forced on your site visitor. Now, they absolutely have their place, but click popups are engaged with by choice, and as such have a considerably higher conversion rate. In fact, they have such a higher conversion rate than other types of popups it's not even worth putting the numbers down. 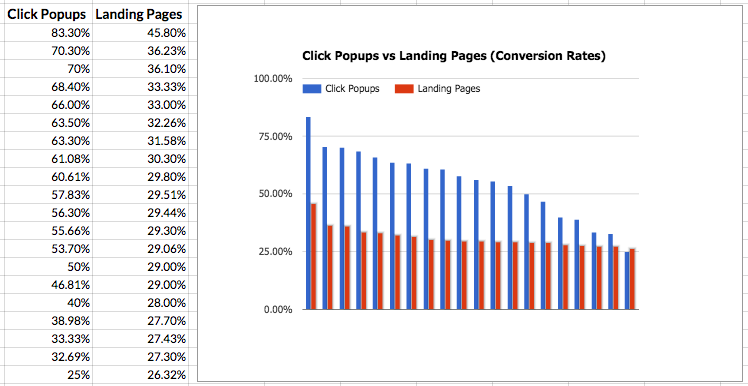 Do your own math comparing 2.5% (our average scroll popup conversion rate) with 54.7% (our average click popup conversion rate). That said, if you want to learn more about other kinds of popups (which really are awesome in their own way) check out "5 Examples of Website Popups that Work." Keep your headline punchy and large, and your body text short. Contrast your CTA button and choose to send people who click on it either to a thank you screen or a URL redirect. You have a couple options here, actually. 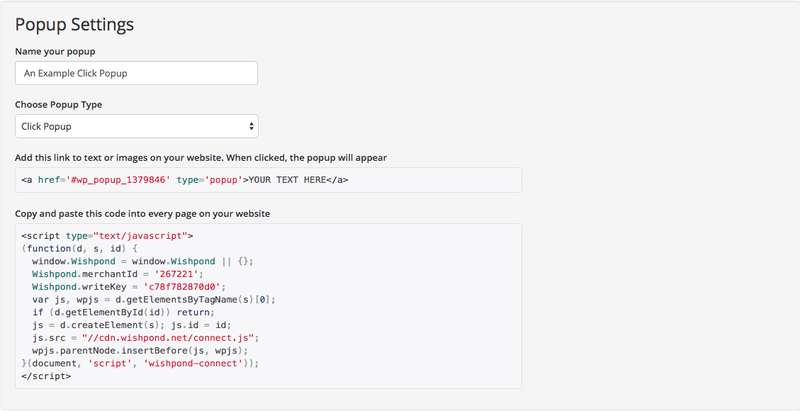 You can either add the popup code into the backend of your wordpress theme code or you can add it into the HTML of each page. Neither takes very long. That's it! Your click popup will be its own campaign and its conversion rate, views, and overall conversions will appear directly in the analytics page just like your landing pages, forms and contests. Bonus Tip: It's very simple to add each of your blog click popups to a segmented lead list. I'd do this for content upgrade downloaders, blog subscribers and blog signups at the very least. Segmentation allows you to better target these leads with lead nurturing content down the line (which turns a lead into a sale). This one's straightforward. Instead of having a subscription landing page, allow readers to engage right within your blog, whether from a scrolling form (with a click popup embedded in it) or with an in-line CTA. Arriving on a squeeze page (or gated content page) and immediately seeing a bunch of fields where you know you're gonna have to provide personal information can be a bit daunting. An awesome way to be sure your page is delivering value before springing the form fields on your prospective leads is to use a click popup. This one is super simple, and you can actually see an example of it at the top of this article. I've added personalized click popups to the bios of the Wishpond blog authors, prompting readers to subscribe to receive each specific author's content. Ecommerce companies can easily attach a click popup to each product within their directory to show more information about that product (as well as an "add to cart" CTA button. This allows browsing customers to remain on the directory without having to go to a specific product page - improving usability. Hopefully our experience with click popups (and a few use cases) has inspired you to test them out for yourself, whether on your blog, product pages, or anywhere else. If you've tested them previously or need a hand getting started don't hesitate to reach out in the comment section below. If you have Shopify or use Wordpress, check out Wishpond's Free Shopify Popup Builder App and Free Wordpress Popup Builder App.